The okonomiyaki master on his all-new food and drink menu. After the ramen revolution and the panko-fried chicken trend of last year, there’s a new Japanese food that’s set to be big in London this year: okonomiyaki. Essentially, these are savoury pancakes, translated as ‘what ever you’d like, grilled’ and know this: they’re bloody delicious. While a few places out East are currently serving up the pancakes, such as Jidori or Tonkotsu, it’s Sho Foo Doh who are leading the way for this new foodie favourite, which is best served loaded with prawns, kimchi or pork belly and topped with Kewpie mayonnaise and tonkatsu brown sauce. Sho Foo Doh means “wind from the pine tree”, according to owner and cook, Fumio Tanga, who named it after his late grandad’s sweet shop in Hiroshima. Fumio’s food stall first blew into Chatsworth Road Market in 2011 and it turned out the snack was a serious people pleaser. After branching out into a few supperclubs and pop-ups, Fumio took his native dish to a three-night residency at the Pacific Social Club in 2013 and has been there ever since, banging out small plates to rival any Shinjuku izakaya plus making that okonomiyaki that people get properly evangelical about. We caught up with Fumio as he prepares to go five-nights a week to find out where he learned his mad grill skills, what we can expect on his new food and drink menu and how Radiohead are sort of responsible for his whole pancake empire. Hi Fumio! You’ve been in the UK for about 20 years now, what made you come over to London in the first place? I’m from Hiroshima originally and I was accepted into university aged 18, but I’d made a mistake on my application form, so I was studying a subject I hadn’t chosen. Then I saw a concert by Radiohead – I think this was around the time of The Bends - and I was completely blown away and I wanted to go to England. I quit university the next day. Wow – who knew Thom Yorke had such sway. What did you do next? I came to London in 1996 and I studied English when I first got here, then studied to be a graphic designer, I got a job straight away, so I did that for three years, then got bored, then I just did everything, like artists assistant, I made t-shirts for a while. I DJ as part of the Comadisco nights, too. When did you start thinking you could make a business out of your cooking? About five years ago. I was working at HMV and I quit, then I was looking for a job and I wasn’t sure what to do. At the time I was living around Chatsworth Road and the market was opening, so I thought I’d try making okonomiyaki. I’d made it a few times for my friends and they all liked it, so I thought I’d give it a go. Talk us through what okonomiyaki is, and the difference between the regional styles? There’s a few different styles all over Japan, but the main two styles are from Hiroshima and Osaka. Osaka style is slightly more doughy version as it’s a mix of batter, cabbage and other savoury ingredients and you dollop it on the griddle, flip it and it’s done. Osaka style uses beni shoga (pickled ginger), and katsuobushi (dried fish flakes) on top, but Hiroshima style doesn’t. It’s more like a crepe, then with sliced cabbage and other ingredients like bean sprouts. The crepe almost works as a lid as it sort of steams it. The other big difference to Osaka style is that it contains udon or soba noodles, so it makes it more substantial. How big is the dish in Japan? It’s very popular in Japan and you can find the Osaka style everywhere. Hiroshima style is getting more popular – there’s about 1,300 Okonomiyaki places in the city - but it’s still more of a regional style. You learned to make the recipe when you were working in a restaurant in high school – were you taught by anyone special? Yeah – there was a master who trained me up on how best to make them. It didn’t take that long though, perhaps a day or so, then there are some key parts that you have to practise a little bit. What was the most important skill you learnt there? The main skill is how thin you can make the crepe. And cracking an egg with one hand. That is never not impressive. When did your stall at Chatsworth Road market start taking off? It was around 2011, I think I hit it at the right time with the whole rise of the street food scene, the market plus the whole area was becoming a bit more hip and it just coincided with everything. Back then, I knew loads of people who were living around there, all my mates so everyone would come down and hang out at the stall, it was really fun. Were you doing any other supperclubs or events around this time? Yeah – in 2012 people would come down to a little private garden by Chatsworth Road where we’d put a gazebo up and serve up food. It was busy every week, then we did at stint at The Dentist, then I would do a few private events, the food at gigs, that sort of thing. 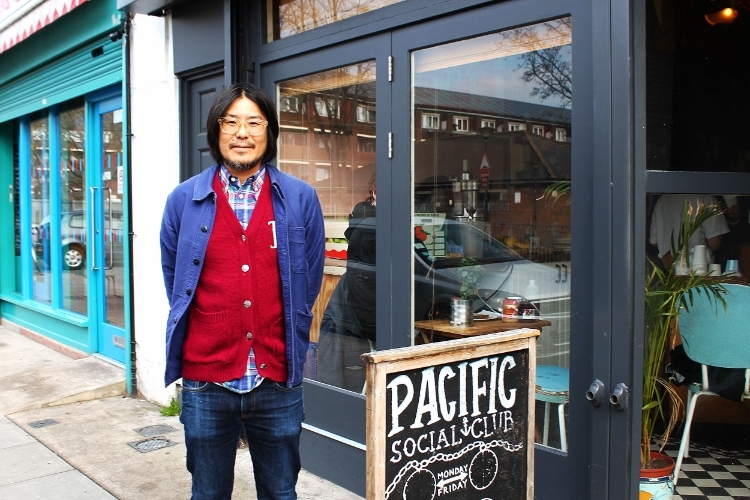 How did you end up at Pacific Social Club? In a roundabout way, it was thanks to Nuno Mendes. He liked my food and told Liam Casey, the owner, about me when they were looking for someone to do evening food, this was in 2013. Liam invited me to do a monthly thing and it just really worked. They were doing the drinks and I was doing the cooking and I really liked the guys so we did it for a year. Then we became more permanent, three nights a week. It’s Thursday, Friday and Saturday the moment, but it’s about to change. We’re almost there with the booze license, so we’re hoping to start serving alcohol from next week. Hopefully in the next month or so, we’re going to be five nights a week, Tuesdays to Saturdays. What sort of drinks can we expect? We’re going to hopefully be serving a Japanese beer on tap, a selection of craft beers, ale and stout then a really good natural red and white wine, just a few of them, by the glass. Then, Sake and a selection of four or five regular cocktails like a kimchi Bloody Mary – because we make our own kimchi – then a Japanese Negroni and a few more we’re going to come up with. What about the food – will there be more amazing little dishes before the okonomiyaki? I think we’re going to focus on lots of more snacks and small bites, we're going to change it regularly, as well. We’ll have one or two specials alongside what we have on the regular menu at the moment. We’re going to have handmade gyoza, then sardine tempura with shiso and umeboshi. It’s so people can stop by and have a nibble and a drink, not just a big meal. The plan is just to make it a cool hangout. Check out our review of Sho Foo Doh here.